Break cashews into 4 pieces, roast and keep aside. Boil water and sugar to make syrup. Grind cardamom into a fine powder. In a thick bottomed pan, start dry roasting the besan on a medium flame until you get a pleasant aroma and it turns light brown. Add roasted cashews and continue roasting for a minute. Add 1/2 the portion of peanut oil. Break lumps and continue roasting on a medium flame for 2 more minutes. Immediately add sugar syrup and cardamom powder. Avoid lumps being formed. 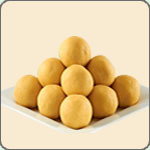 Wait till it cools a little and try making balls/ladoos. If mixture is dry, gradually add remaining peanut oil.